MS Dhoni is one of the best wicketkeepers's ever against spin bowling and has got the fastest hands in the game. His stumping speed has always stunned people. In the game against the KKR, there was yet another lightning-fast stumping that got Shubman Gill out of Tahir's bowling. Tahir bowled a googly which Gill didn't really pick. As he Gill briefly dragged out of the crease, Dhoni removed the bails in just 0.28 seconds!!! The other interesting thing was that Imran Tahir started to celebrate even before the bails were taken off. 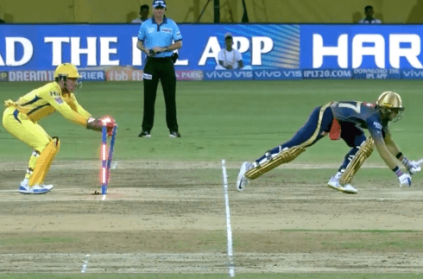 Here is the video of that Superfast stumping from the Super King Dhoni. This page contains news relating to various facts and events. The views are generally about current affiars and general topics in diversified areas such as political, international, national, and regional issues, sports, health, travel, lifestyle, technology and business. People having similar interets on the above topics will find this page useful. Dhoni's lightning fast stumping to get Gill out. | Sports News.